The New Growler Law - What does it mean for NC Breweries? 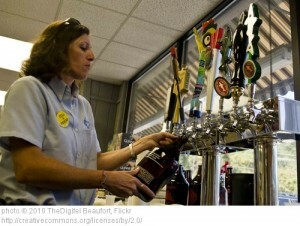 You are here: Home / Beer / The “New” Growler Law – What’s it mean for NC Breweries? Which beers can go in that growler? OK. That’s great, but what does it mean? Well, the text of the changes can be found here. The main thrust, as I see it, is: breweries can now refill growlers from other breweries. So, what does that mean for me as a beer purchaser? It means that I can get any of the growlers I have filled by any brewery (woohoo!). I can get fresh beer from a brewery without having to buy one of their growlers (and remember to bring that growler back to that brewery to get it filled). It’s a little tougher if I’m a brewery. I can fill growlers that I couldn’t before but now I’ve got some labeling issues to worry about. Now I have to have a way to label someone else’s growlers with my name and information PLUS a fill date and a way to reseal them. Now, based on the way most breweries in NC seal growlers for off-premises sales (such as at your local bottleshop), sealing the growler doesn’t seem like it would be a huge deal. But the labeling… hmmm…. I propose that NC breweries, as they order new growlers, dedicate a space on the growler for generic labels that can be pasted on when they’re refilled. Breweries could then pre-print labels (ready to be slapped on) and a date handwritten on the label (maybe even check-boxes for the different beers made by the brewery). Something like here. Perhaps the NC Brewers Guild could come up with some guidelines that the state breweries could use to facilitate better sharing?